If you’re looking for a civil ceremony in Los Angeles, Orange County, Ventura County, or anywhere in Southern California, I can help you. I also travel to San Bernardino County, Riverside County, San Diego County and Santa Barbara County, and even Catalina often. Sometimes my family comes along (but not to the ceremony), and makes a trip out of it. A civil ceremony is something I’m known for. Even though technically, I’m a wedding minister and specially authorized marriage license issuer, I’m also an attorney and am pretty well-versed in the laws and regulations of the County and the State in regards to marriage and marriage licenses. So even though there is no such thing in California as a justice of the peace, I’m about as close as you can get to one. There are many ways to have a civil wedding ceremony. For some people, they just want a quick and easy way to be legally married. They aren’t interested in the big hoopla of a large wedding. I can go to any part of the state to help them get married in a civil wedding. I have found over the years that some couples are very private and not interested in a public display of affection. This doesn’t mean, obviously, that they’re not really moved by the ceremony. In fact, unexpected tears often flow even though couples intended to have a private, simple and business-like “legal” ceremony. It’s funny how that happens. But I’ve seen all sorts of scenarios in the wedding ceremonies I’ve officiated. Some couples aren’t religious, being atheists or agnostics or not even considering a label for it. So they want a nonreligious civil wedding ceremony. I understand that and can alter a wedding ceremony to take the religious parts of it out, but leave the feelings of love and commitment intact. I can perform the wedding ceremony to your personal desires. All that matters is that you and your spouse are happy. Many people write their wedding ceremony themselves. I must include only a few legal requirements to ensure that your wedding ceremony satisfies the legal requirements of the law. In the simplest civil ceremony, I must ask each of you if you want to be married, and I must announce your marriage. Anything else will be just icing on the cake. Some people ask me to marry them in a completely unemotional, business-like way. They want to attach no feeling to it. For them, the civil wedding ceremony is just a legality, a business transaction, because they either had or will have a “friends and family” wedding ceremony. This is usually done for insurance, tax or immigration purposes. I am sworn to confidentiality and the kind of marriage license I issue is also confidential. Nobody else will ever need to know, and it will remain your secret. I am legally obliged to tell nobody. The California Confidential Marriage License is then filed, in person by me, with the LA County Clerk Recorder and never allowed to be displayed to the public. 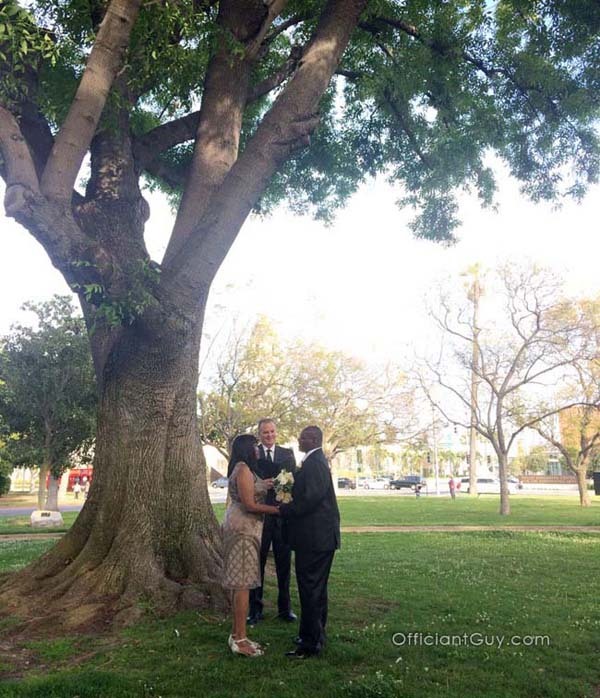 A civil wedding ceremony with a California marriage license can be performed anywhere in California. I usually officiate civil ceremonies in Los Angeles County and Orange County, but I have been known to travel much further than that. It could be done at the park, on the beach, in your office, in a restaurant or coffee shop. 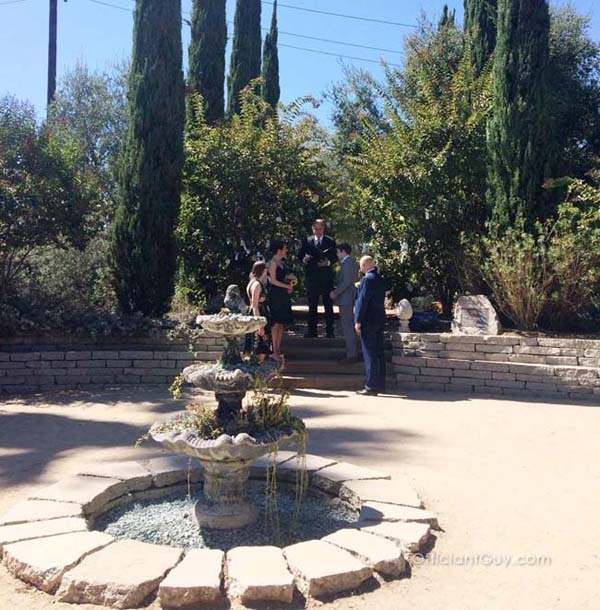 I’ve officiated them everywhere including in a car, in a hot tub, crossing the street, in a helicopter, at the airport, on a rooftop, on a Ferris wheel, in a parking lot…the sky is the limit and your civil ceremony can as unique as you want. So, if you’re looking for a civil wedding officiant, I can be your guy. Give me a call. You meet some interesting folks when you are traveling. 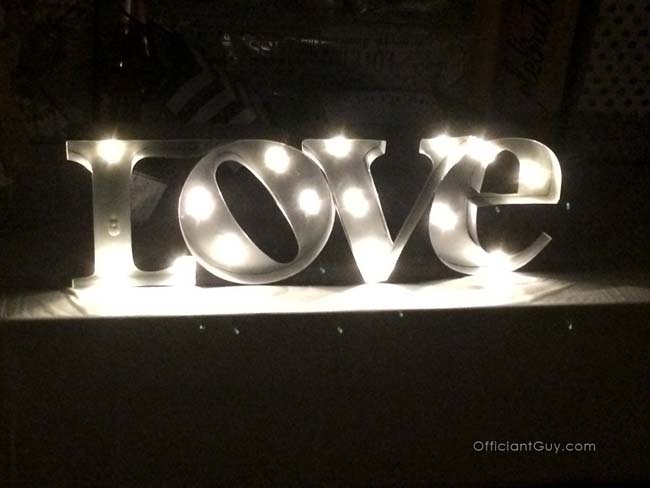 How do I find a wedding officiant near me? Do You Get a Marriage License Before Or After The Wedding? Can I Get a Marriage License After Our Wedding Ceremony? 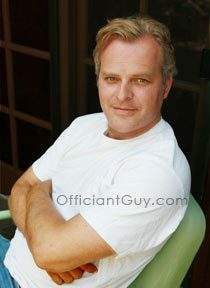 This officiant has affiliate links on this website that he gets a referral fee for. However, they’re not random. They are services that we actually recommend. We’ve done the research for you. It’s our thank you to you, and it helps us out a little bit. 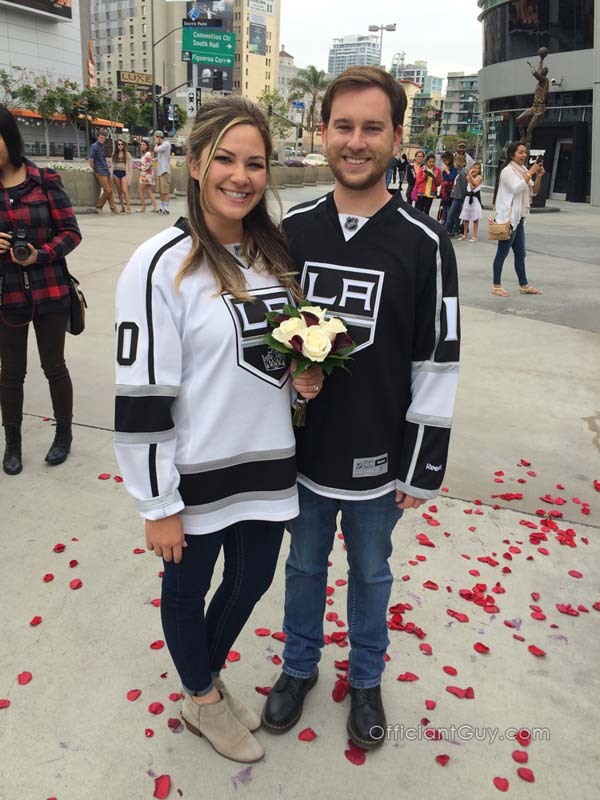 Looking for a Los Angeles wedding officiant? Need a confidential marriage license? This wedding website contains original content is © Copyright Christopher Robinson, Officiant Guy, All Rights Reserved. If you use the content on this website in any form, credit and a link back to our website must be given which is explained on our copyright page.